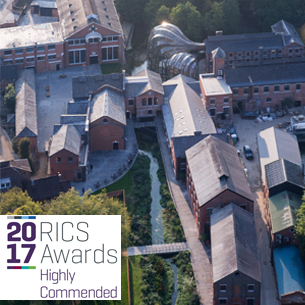 We are pleased to announce that the Bombay Sapphire Distillery and Visitor Centre scheme was High Commended at last nights RICS Awards. The award given in the Tourism and Leisure category, honours the projects outstanding contribution to facilities in the region. GWP Architecture and GWP Project Services Directors Richard Townend and Barry Rankin hosted a table of clients and collaborators at the event from Bombay Sapphire, Visage Properties and Newlove & Hill Consultancy Ltd.
47 of the South East’s most impressive and community beneficial property schemes battled it out for top honours at the RICS Awards 2017. TV Presenter Sameena Ali-Khan hosted this year’s sell-out ceremony, held at the Hilton at the Ageas Bowl, Southampton, which attracted over 200 local property professionals. This award follows recent success at the Civic Trust awards held in March with the scheme winning the Special Award for Sustainability. Head to our project page for further details of the Distillery and Visitor Centre and click here for details of the RICS Awards 2017.